Long live the king, sneered Android TV as it threw Google TV off the cliff and into a herd of stampeding wildebeests. Well, not exactly, but Android TV is replacing the now-five-year-old Google TV Apple Patents Bendy iPhone, Android TV Replaces Google TV [Tech News Digest] Apple Patents Bendy iPhone, Android TV Replaces Google TV [Tech News Digest] Apple patents a bendy iPhone, Android TV replaces Google TV, the FBI maintains North Korea hacked Sony, David Cross looks to BitTorrent, Bill Gates drinks human waste, and a basketball referee makes the wrong call. Read More . And it’s not just an update — it’s a complete remake. Only a tiny fraction of Google TV devices will be updated to Android TV. For all intents and purposes, Android TV is a new beast. Google is, once again, coming for your living room. So what exactly is this new technology, and how can you get your hands on it? It’s an operating system (OS). It’s a version of Android 5.0 Lollipop Android 5.0 Lollipop: What It Is And When You'll Get It Android 5.0 Lollipop: What It Is And When You'll Get It Android 5.0 Lollipop is here, but only on Nexus devices. What exactly is new about this operating system, and when can you expect it to arrive on your device? Read More made just for TVs. But what that means for the average consumer is a much more cohesive relationship between all their smart devices. This OS will come built-in to some TVs in 2015, and also in the form of set-top boxes to magically transform your normal TV into a smart TV. The set-top box arena is already pretty crowded Chromecast vs. Apple TV vs. Roku: Which Media Streamer Suits You? Chromecast vs. Apple TV vs. Roku: Which Media Streamer Suits You? Media streaming devices are simply awesome. Those little boxes that connect to your TV can add a wealth of entertainment options to your living room. But which device is best for you? 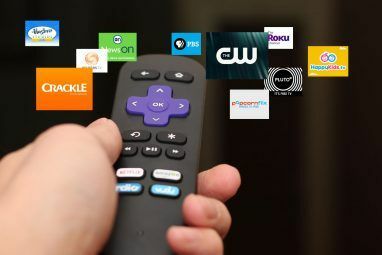 Read More , with options like the Roku (our review Roku 3 Review and Giveaway Roku 3 Review and Giveaway As more content becomes available online, the need for a traditional television subscription may not be enough anymore to justify the costs. If you’re already subscribed to services like Netflix or Hulu Plus, now may... Read More ), Apple TV (our review Apple TV Review and Giveaway Apple TV Review and Giveaway Apple introduced its set-top digital media player in 2007, and it's currently on its third generation of hardware. Read More ), and Amazon Fire TV (our review Amazon Fire TV And Fire TV Game Controller Review & Giveaway Amazon Fire TV And Fire TV Game Controller Review & Giveaway Amazon launched the Fire TV, a media center device not unlike the Apple TV, but with gaming as perk. Read More ) all offering compelling products. Some TVs by Hisense and TCL already ship with Roku TV built-in, just like what Google is trying to get manufacturers to do with Android TV. As for a set-top box already running Android TV, look no further than the Nexus Player Nexus 6, 9, Player, and Android Lollipop: Everything You Need To Know Nexus 6, 9, Player, and Android Lollipop: Everything You Need To Know It's official: Android 5.0 Lollipop is here and is bringing with it three new devices: the Nexus 6, Nexus 9, and Nexus Player. Here's a comprehensive rundown of all the new hardware and software. Read More . It has received mostly lukewarm reviews since its release in November 2014, mostly due to a lack of apps and lack of TV pass-through — but as the OS matures and more hardware manufacturers get on board, those problems will surely fade away. Android TV, in fact, supports the Google Play Store and the wealth of apps there. The biggest problem is that developers have to design a 10-foot user interface version of their apps if they want them to be usable and enjoyable on the big screen. The good news is that since Android TV is linked so closely to standard Android 5.0 Lollipop that developers can use the Android SDK to easily develop both for the smartphone/tablet and TV operating systems. Assuming that Android TV gets the kinks worked out of it in the coming months, users can expect a few major features. Voice control. Using a microphone built in to your remote, gaming controller, or smartphone, you can ask Google anything you want and the intelligence behind Google Now 6 Google Now Features That Will Change How You Search 6 Google Now Features That Will Change How You Search You may already be using Google Now on your Android device, but are you getting all that you can out of it? Knowing about these small features can make a big difference. Read More will respond well. Gaming. Google is really working on improving the gaming experience here, so expect a larger push of Android TV-compatible games and controllers. Screen-mirroring and content sharing. Have a photo or video on your phone that you want on the TV? No big deal. Consistent interface. Google TV was hounded for its inconsistent, clunky interface, but Android TV is built on Material Design principles Exploring Android L: What Exactly Is Material Design? Exploring Android L: What Exactly Is Material Design? You may have heard about Android L and Material Design, but what exactly is this new design philosophy and how will it affect Android and other Google products? Read More and should fit right in with your phone’s OS and all those Material Design-inspired apps Craving Some Material Design? Download These Great Android Apps Craving Some Material Design? Download These Great Android Apps Android 5.0 Lollipop is here, but to get the full effect, you need apps that stay true to the Material Design philosophy. We can help you find the best of them. Read More . Want to see some of that in action? Sony has produced some of the cheesiest commercials on this planet, but they also happen to demonstrate Android TV’s features pretty well. Above, you can see the most awkward family ever using the Voice Search and Google Cast features. In this video, Sony shows off the gaming aspect of Android TV with what looks to be a group of teenagers forced to sit around and pretend to like each other. Hopefully your gaming experience on Android TV won’t be quite like this — but you get the idea. Basically, if all turns out as Google says, Android TV should allow your TV to become an extension of your phone or tablet that is integrated into all the same Google services you’re already using. It looks pretty awesome, but as we said before, it is entering a crowded playing field. Think of Android TV as the OS for TVs in the same way that Android is the OS for phones. However, in the smartphone realm, tons of hardware manufacturers have adopted Android as their OS without a problem, but the TV market is looking to be much more fragmented than that. 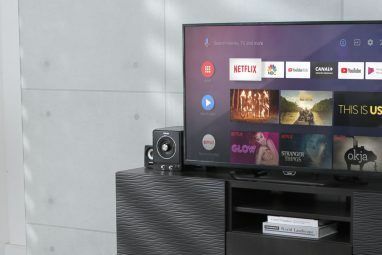 Samsung, a leader in smartphones and TVs, won’t be using Android TV in their newest Smart TVs. Instead, they use a proprietary software developed by Samsung, and they’re calling their products simply Samsung Smart TVs. They’ve actually been in production for a few years now, and they have a few apps available for them like YouTube, Netflix, Pandora, Amazon Instant Video, and Hulu Plus. Some models even have a camera for Skype video calling. The OS itself is pretty crowded. There are separate screens you can rotate to access, all trying to get you to buy and use Samsung products, which often feels like bloatware What You Need to Know About Removing Android Bloatware What You Need to Know About Removing Android Bloatware Lots of phones come with annoying pre-installed software, but you can remove it. Here's how. Read More — something anyone with a Samsung phone can attest to. LG, another big name, is using their own webOS software to power their TVs. They’re eloquently calling them Smart TV with webOS. Rolls right off the tongue, doesn’t it? This OS was sold to LG by HP (after they acquired Palm, who originally developed it). Maybe you remember HP’s failed TouchPad The User's Guide To HP TouchPad The User's Guide To HP TouchPad Featuring the webOS operating system, the TouchPad offers a user interface that is polished, attractive and–most importantly–easy to use. Read More , which ran webOS. This OS look simpler than Samsung’s crowded OS, but without a large app store or the power of Google Now behind it, it’s difficult to say how long it can stick around. Though its mascot, BeanBird, is pretty cute, and its design philosophy is simpler and looks more enjoyable than most of its competitors. It has a basic-looking interface, but most importantly, it has apps from Netflix, Amazon Instant Video, Spotify, Pandora, Hulu Plus, and more. Panasonic has what they’re calling Smart Viera, Philips is using Net TV, and Toshiba is using Toshiba SmartTV. There really is just a ridiculous amount of TV operating systems out there right now. Fortunately, Sony, Sharp, and TPVision (a subsidiary of Philips) have all said they’re making Android TV-powered televisions. Sony’s line of BRAVIA TVs, as well as the products from Sharp and TPVision, should be hitting the market sometime this spring or summer at the latest. At that point, which OSes will win out the Smart TV battle is anyone’s guess. Introduced all the way back in Fall 2010 What is Google TV and why do I want it? What is Google TV and why do I want it? Read More , Google TV is now dead and gone as of January 2015. It had a solid four years, but few will be sad to see it go. It was mostly received as a half-baked OS that wasn’t given enough attention by Google. That should be over now as Android TV is being treated as a major product intrinsically connected to other Android products. A small subset of Google TV devices will get an upgrade to Android TV, but most will not (though Google didn’t say which products would get the update). If you have a TV or set-top box running Google TV, it will continue to function as normal, just don’t expect any major updates or changes to the platform. Google TV devices were actually manufactured by a variety of different companies including LG, Sony, Logitech, Vizio, ASUS, HiSense, and Netgear. It took the form of TVs as well as set-top boxes, but ultimately it didn’t take off in the way Google had planned. So, Google TV is gone, but I think we can all agree that Android TV is a worthy replacement. Where Can I Get Android TV? You could buy the already available Nexus Player direct from Google for $99, though it might not be the bastion of Android TV’s abilities that many would like. With limited internal storage, no TV pass-through, and a general lack of ports on the device, it’s certainly not for everybody. Interested in gaming? Then you might want to try the Razer Forge TV, which was announced at CES 2015 and should be hitting the market this quarter. This set-top box costs $99 alone or $149 with a gaming controller. It has better specs than the Nexus Player, an ethernet port, and it can stream PC games from your computer. It’s a gaming powerhouse meant to show off everything that Android TV can do in that department — and for that, it’s pretty cheap. Sony’s line of BRAVIA TVs running Android TV should be arriving sometime this Spring, though you can sign up to be notified when one of their new 2015 TVs becomes available. Keep in mind, these likely won’t come cheap as they are high-end, top-of-the-line models. Also keep an eye out for TVs from Sharp and TPVision (though it’s possible TPVision could release TVs under the Philips brand name). They should be coming by the summer, but you can check back every once and a while at the official Android TV website: Android.com/TV. You might notice that Google’s official website for Android TV is Android.com/TV and not AndroidTV.com; there’s a reason for that. Back when Google was looking at the possibility of creating Android TV, they tried to get that domain name, only to find that it was already taken by a company called Exo Level. The folks of at Android Police did some great investigating, and what they found is interesting. Google actually had an ICANN hearing back in March to contest the domain, but their case was denied. It’s easy to see how someone could be misled, though, since the site markets an “AndroidTV” that is actually just a set-top box from Exo Level running an older version of Android. At the time of this writing, however, the product doesn’t seem to be available on the website anymore. Android set-top boxes Android TV Boxes: What Are They, And What Can They Do? Android TV Boxes: What Are They, And What Can They Do? Companies like Apple, Roku and Western Digital have already capitalized on this with their set-top boxes, but now a new wave of Android options has hit the market. Typically available for between $60 and $100,... Read More have been around for a while; in fact, we’ve reviewed some like the ProBox2 EX Probox2 EX Android TV Box Review and Giveaway Probox2 EX Android TV Box Review and Giveaway Android boxes designed for connecting to a TV have been around for ages - the Probox2 EX is the latest and most powerful model in the market. Read More . These things hit the market from lots of unknown third-parties and had quality control issues across the board, but some worked out well and people loved them. They even made them in stick form called “Android TV Sticks” to compete against the Chromecast — and we examined the differences between those devices Google Chromecast vs. Android TV Stick - Which Should You Buy? Google Chromecast vs. Android TV Stick - Which Should You Buy? What exactly is the difference between a Google Chromecast and a generic Android Mini PC stick? Read More while also reviewing some like the BiggiFi Android TV Stick BiggiFi Android TV Stick Review and Giveaway BiggiFi Android TV Stick Review and Giveaway How smart is the BiggiFi? Let's find out. Read More . The problem with these Android set-top boxes and TV sticks, though, is that they’re not designed for TVs. You’re running a phone software on a TV, and that’s just awkward no matter how you slice it. It’s treated as a completely different Android device, meaning it’s not even easy to share your screen or content from one to the other. The official Android TV platform solves all that by being built specifically for TV usage. So don’t fall for the fakers. Visit Android.com/TV to learn more about Android TV, and avoid the sketchy AndroidTV.com. Are You A Fan Of Android TV? For Google, a lot is riding on the success of this new platform. What do you think of it? Will you be picking up an Android TV set-top box or TV when they become available? Are you holding out for something else? Let us know in the comments. Explore more about: Android TV, Media Player, Television. Still love my NSX-40GT1 just wish I got the 46". I am now in the process of getting an NSZGT1 so I can keep this for other TVs. All this new stuff is just glittering re-hash WITHOUT THE KEYBOARD REMOTE. Everybody that buys one of these new TVs complains about not getting a keyboard with the TV. The Sony GoogleTV remote is amazing and love it. Ever since Google stopped supporting Google TV, it is dead because most apps stopped working or were pulled off. Worse, Sony did not provide upgrade to Android TV on its Google TV player. Google and Sony didn't care about abandoning their customers and they are likely to repeat the abandoning acts on Android TV and players. On Black Friday, I purchased a Roku 2. Quality-wise (streaming, ease of use, ...) it is five times better. Channels-wise, it is fifty times better. I am glad I was forced to make the switch and now enjoy much, much better Smart TV watching experience. And I am very glad that I abandoned Google and Sony and went with Roku! The chinese boxes are eons ahead. You can buy boxes with HDMI input so you can record from your tv box, and some of the never boxes are fully equiped hdmi encoders too (you can connect a PS4 to the box then simply type the LAN ip address it broadcasts to and watch blurays on your cellphone or tablet 1080p@60fps) or stream your gameplay directly to youtube. I'd rater buy a chinese android box than buy into another google tv, that they remove native youtube (and youtube casting) support 4 years from now. Yeah man I love google tv but I hate google for dropping it. What about the people who spent their hard earned money just to later say oh we are killing our product. Alredy import a Nvidia Shield TV Pro frome Amazon to sweden and that has must of all my friends also do. The Nvidia Shield still have alot of issues but when Nvidia has fix all the issues am relly think Android TV gonna have a big shot to win the market. And am guess the company some denid Android TV, gonna lose market share to that company some do run Android TV. In my case, i relly do like to pay for the apps and software and get to use it one all the devices like the play store, i would not like to buy same apps over and over and over for diffrens OS all the time. + Google has the apps and services i do use daily, with out that am problie not gonna buy it. Great article :). For those who live outside US like me, you can access Netflix, Hulu and similar media stations on your Google TV by using UnoTelly or similar tools. I am an early adopter to Android TV. I have the Hisense Android TV. After having the ill faded Logitech Google TV box which was just a mess I enjoy my new TV but it is still not without problems. You cannot hook up a camera and Skype. The Skype won't even download. There is no picture in picture feature and they cannot fix my sleep timer. I can only set the timer for 30 minutes or less for it to work. I am hoping Hinsense will offer an upgrade to Lollipop and fix the issues with my TV. I really hope at least one of the makers of these new Android TV set top boxes makes one with a hdmi integrated passthrough, like the vizio co-star. It was a really amazing device that I believe was ahead of its time. The problem was lack of support from google and vizio. what? um, I don't think we've been duped. much of the content accessible on Smart TVs is free and ad-supported (see: YouTube), just like TV is. Also, Smart TVs still show traditional TV channels with commercial breaks. It's just like a regular TV plus some extra features. May not be for everyone, but some people are gonna love it. I won't be replacing my 2011 SONY NSZ-GS7 any time soon. With a single excellent remote control, I (AND my wife!) can select among all our fibre-optic channels and everything Android 3.2 provides. Youtube, Netflix, Crackle, Plex, Al Jazeera and so on. And it's not limited to the admittedly sparse Google TV version of the Play Store, because sideloading through DropBox is so simple. You're watching local fibre, and something the presenter is discussing piques your interest. With the Google TV remote, you send the broadcast into a thumbnail in the corner and look up the background on the Internet - a historical, cultural, entertainment or sports-related fact - then you can return the broadcast to full-screen. And if I were so inclined, I could replace the original SONY remote with a newer one (from 2013) that has a built-in microphone that does voice search. I have honestly not seen anything in this article or elsewhere that would persuade me to upgrade my 2011 technology to the 2015 Android TV. Jeff, what you propose is a Skipr.tv feature. Btw, thanks for signing up for the beta, much appreciated! amen to that, i use that all the time and when I went to go look at new TVs I could not believe that none of them had this feature, thus my purchase of the NSZGT1 box. Screw new. "Though it’s mascot, BeanBird..." *Its* "It's" always means "it is" or "it has," the version without the apostrophe is the possessive. "Samsung, a leader in smartphones and TVs, won’t be using Android TV in their newest Smart TVs. Instead, they use a proprietary software developed by Samsung..."
Looks like Samsung has finally found a use for Tizen. is it running Tizen? I haven't seen that confirmed anywhere, but that would be very interesting. I wouldn't necessarily refer to the Nexus Player as a set-top box. It lacks an HDMI input and functions solely as a Streamer and game box. We created the Skipr.tv platform on Google TV hardware and are eagerly awaiting news of Android TV-specific set-top boxes (or buddy boxes in GTV lingo). So far the news has been few and far between although we expect the marketing push for ATV to surpass the mediocre GTV campaign so that should mean better app support. yeah hopefully with better support from Google, Android TV will really take off, and if that happens there should be so many apps popping up! I would like to see Android TV available for older PC desktops. I have and old Athlon+ 3000, 64 bit, that would probably make a very good "set top box". That and an HDMI output, I'm good to go. :O that would be super cool. good idea. GoogleTV was god-awful. I had three or four different boxes and while they were functional, they were slow and had painful UIs. There were never more than a few dozen GoogleTV apps, which only exaggerated the problems for the platform. I actually have a Nexus Player sitting around someplace. For being a $100 device from a major corporation, it feels like a half-finished implementation of what Amazon did with the FireTV. I'm particularly disappointed in its remote and lack of support for direct ethernet connection. While I appreciate that it's now at least possible to take advantage of more standard Android applications, the only compelling argument I could find for the Nexus Player was the more direct access I would have to Play Music, something I already have on unsupported platforms via Plex Media Server plugins anyway. My Nexus Player went back in its box not long after I got it. I have hopes that there will be some third parties that do a better job of implementing AndroidTV, but I'm not going to buy a TV for smart TV features anyway. In my opinion, nearly everyone will have a better experience with a purpose-built set top box anyway. Smart TVs skimp on RAM and processing horsepower since those features are always going to be an afterthought for consumers, and it shows. interesting analysis, thanks for your input! The only place I see mine being slow is with the websites with ads bloat. For those I just load them with a ad stripping link . Solved. Aps slow? didn't get that either , and yet I only use the google play , pandora, various little aps. I mostly use it for pulling up webpages instantly and surfing like its a computer, which it is.